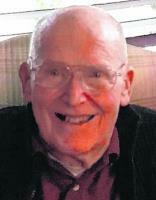 "We enjoyed Bob's company on several levels, North County..."
"Bob Peck was a lovely man. My mother, Marie..."
"Dear Peck Family: Mr. Peck was my art teacher at BGHS in..."
"When I served as public information officer for Battle..."
"Megan - So sorry on the loss of your dad. He was a very..."
Robert "Bob" Peck, 86, of Battle Ground, WA, died on March 21, 2016. He was born on May 9, 1929 to Gilbert and Beatrice Peck in Yakima, WA, but lived in Selah, WA, where he graduated from Selah High School in 1947. Bob later graduated from WSU in 1953. Bob served in the Army at Fort Knox, KY. He received his Masters of Teaching from WSU. In 1958, Bob started teaching art at Battle Ground High School where he continued for 37 1/2 years. Bob and two buddies started PGS Silkscreen that featured N.W. Native American art-design calendars. He is survived by his wife of 50 years, Nancy; daughters, Megan Leifson (Michael) and Allison Tuchardt (Brad); grandchildren, Aaron and Bethany; and son, Roger Peck (John Dew). Memorial services will be held on Sat., May 21, 2016 at 4:00 p.m. in the Battle Ground High School Lair. Donations can be sent to the Battle Ground School District Office - BGHS Art Department or Clark County 4-H Leaders Assoc. Scholarship.